Bosn's Favorite Jerky! Take a few of these cans out to sea for a high-protein snack! 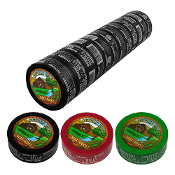 Buffalo Bills Beef Jerky Chew has been a great seller with kids of all ages for over 20 years. Packed in a convenient pocket-sized 0.44oz can, this coarsely shredded beef jerky chew is available in 3 flavors - Hickory, Spicy, and Teriyaki.